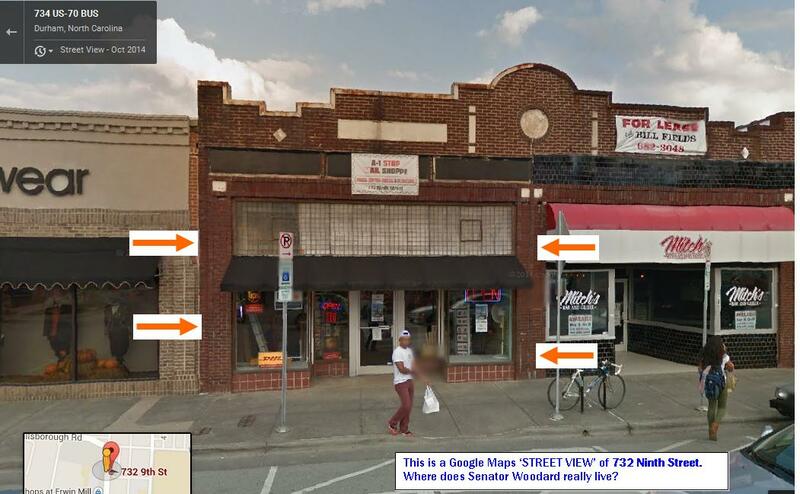 Update: Oct. 31, 2014 – Greg Amick, Carmichael’s campaign manager, stepped down Friday. 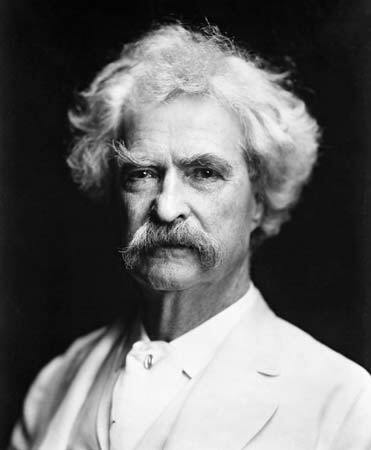 This time documenting Democrats AND Republicans committing Felonies. Why is a Doretta Walker campaign worker allowed into the Durham County Board of Elections while Voting is taking place? Mecklenburg County seems to have a LOT of Problems. 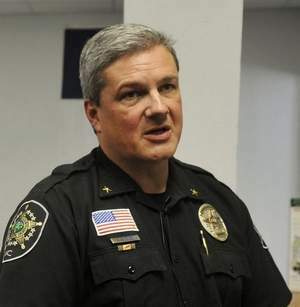 They have BOTH candidates for Sheriff that support Illegals casting a ballot. Carmichael & Hailey! And a District Court Judcial Candidate, Yolanda Trotman. Yolanda Trotman running for District Court Judge Mecklenburg County. Republican Chris Hailey running for Mecklenburg County Sheriff. (18) For any person, knowing that a person is not a citizen of the United States, to instruct or coerce that person to register to vote or to vote. Respectfully submitted by SilenceDogood2010 this Thirtieth Day of October in the Year of our Lord, Two Thousand and Fourteen. Tuesday October 21, 2014 was a busy day on the DACA Front. Lady Liberty & the Founding Principles took some minor causalities. We might be wounded a little, but the BATTLE is far from over — You know how Americans will fight for Liberty & Freedom. (e) Correcting Registration Forms. – If the voter fails to complete any required item on the voter registration form but provides enough information on the form to enable the county board of elections to identify and contact the voter, the voter shall be notified of the omission and given the opportunity to complete the form at least by 5:00 P.M. on the day before the county canvass as set in G.S. 163-182.5(b). If the voter corrects that omission within that time and is determined by the county board of elections to be eligible to vote, the board shall permit the voter to vote. If the information is not corrected by election day, the voter shall be allowed to vote a provisional official ballot. 3rd Item: We got some Press Coverage —- YEA!!! GO TEAM!!! 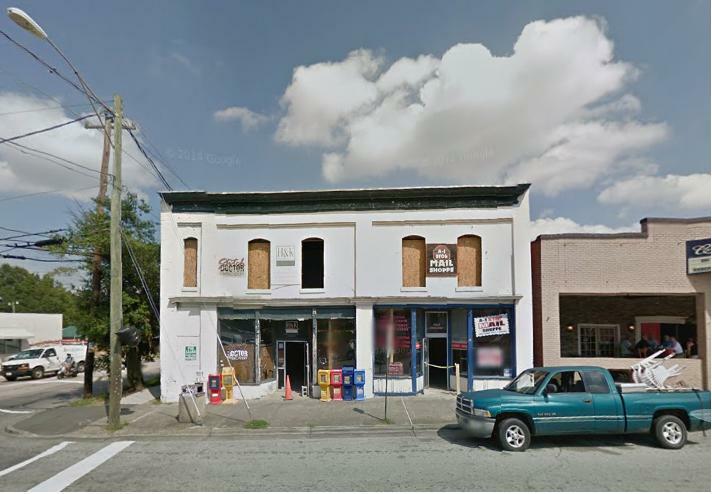 — No wait… it was via the Winston Salem Journal. *** Deep Sigh*** And what do we expect from a Liberal Newspaper? Skewed facts and LOTS of Mis-Information. 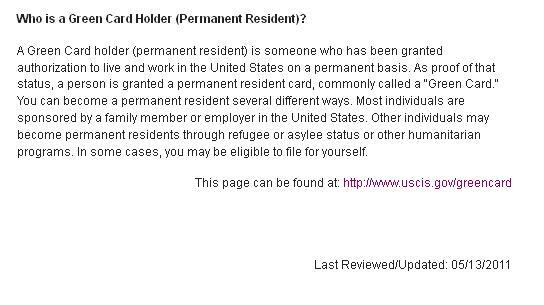 SD2010 Response – If they have been issued a DACA Drivers License, they are ineligible to vote. PERIOD! The NC State BoE and DMV folks are either lying or they are mis-informed. If you are a Green Card holder, you are NOT ELIGIBLE for DACA Status nor are you entitled to vote. From the Article – “Most have become U.S. citizens since getting a license, according to an estimate by elections officials based on a sample of the overall list. Earlier this month, State Board of Elections officials sampled about 1,600 of the 10,000 names, Lawson said. 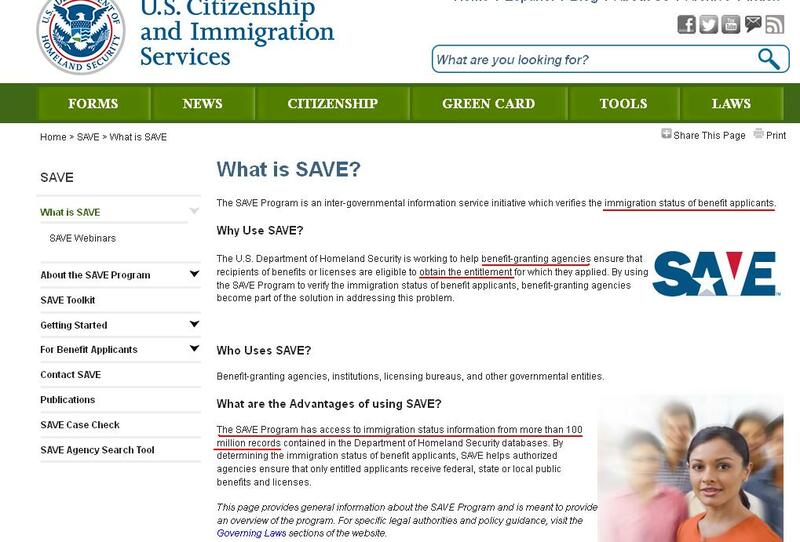 They cross-checked the names against a U.S. Department of Homeland Security database, known as SAVE, and found that 94 percent of those 1,600 are in fact U.S. citizens, Lawson said. 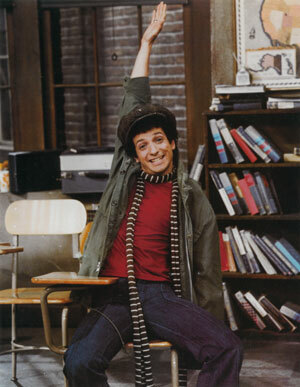 Response from SD2010 – NO – NO – NO – NO!!!! 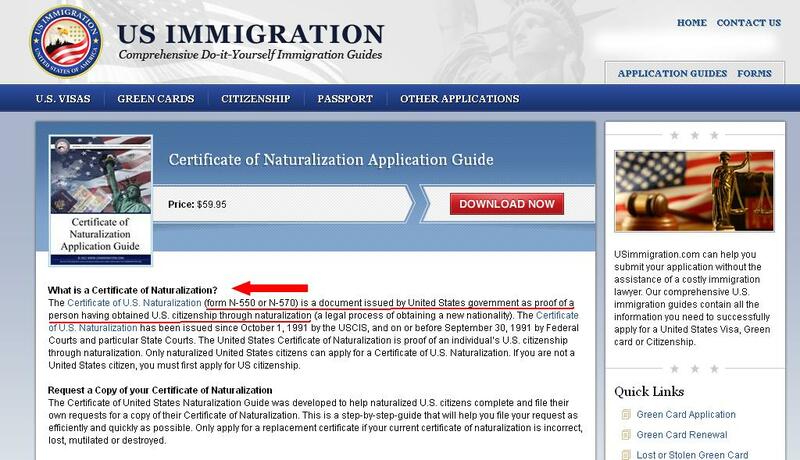 You do NOT go from being a DACA ‘CERTIFIED’ individual to a full fledged US Citizen in 1.5 years (March 2013 – October 2014). It just can NOT happen! Ask any Naturalized Citizen how long it takes them to become a Citizen. 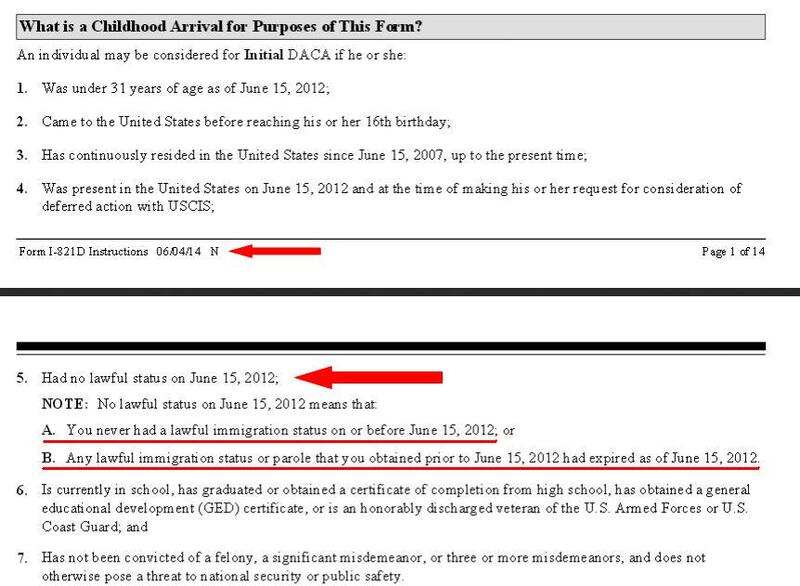 Remember now, this DACA System was born on June 15, 2012 and is a POLICY by the Dept. Of Justice & Homeland Security to defer deportation of Illegal Alien Children. If you have a Green Card, you’re NOT a candidate for the DACA program. If you are in the process of becoming a US Citizen, you are NOT a candidate for the DACA Program. 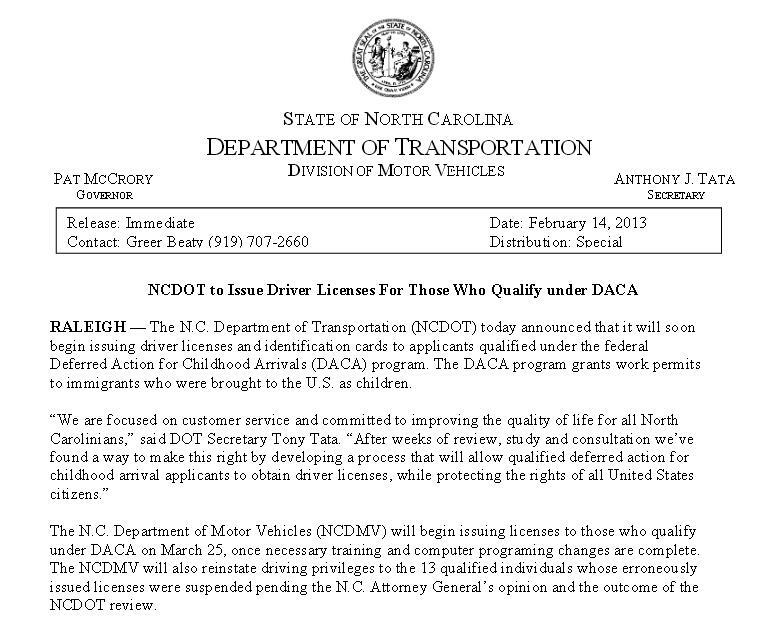 DACA was adopted by the NC DOT around February of 2013 and they started issuing licenses in March of 2013. Here’s the Press Release. • Have not been convicted of a felony, significant misdemeanor,or three or more other misdemeanors, and do not otherwise pose a threat to national security or public safety. What does ‘No Lawful Status’ mean? 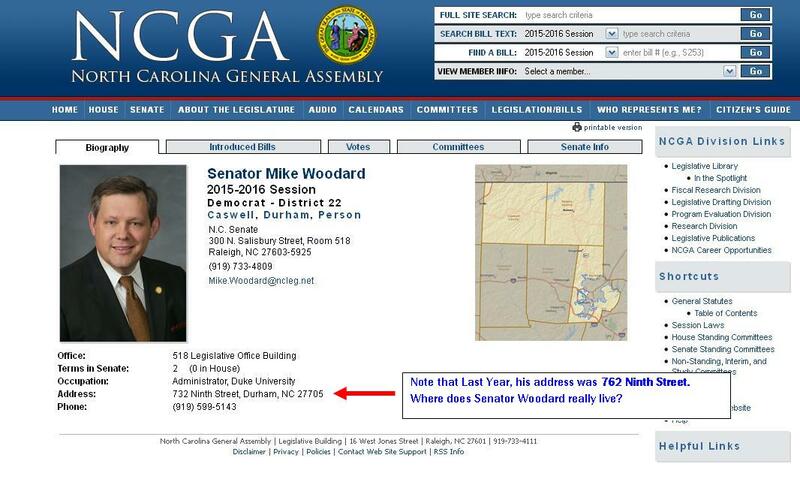 * Your contacts at the NC State Board of Elections. * Your Local Board of Elections. * Folks that you’ve talked to at NC DOT/DMV. Please urge Pat McCrory to issue the Executive Order ASAP! Respectfully submitted by SilenceDogood2010 this Twenty Second Day of October in the Year of our Lord, Two Thousand and Fourteen. The NC DACA problem is getting some attention. Several things happened today and this post is an update to bring everyone up to snuff. 1st off, I heard from James Johnson,President of NCFIRE and I believe that a local NC Newspaper interviewed him today concerning the DACA SNAFU. 3rd item: Bart also today informed me that he had contacted the lady at the DOT… the one that supplied James Johnson with the numbers of the DACA Issued Licenses (14,836 thru 9/20/14). Bart requested a list of Names & Addresses of those that resided in HIS COUNTY alone. Sophia Spencer (the DOT Records Manager) informed him that she would check with DMV to see if they could “Break Out” that information for him. He also stated that he made it very clear as to what he wanted the info for, and that she completely understood his request. As of this post, he has not heard back from Ms. Spencer yet. 4th item: Bart (who shall for the rest of this post be referred to as “Radar O’Rielly – the DACA Clerk”, since he seems to know who to go to, and he gets things done) was in touch with Senator Phil Berger’s office. Radar said one of Berger’s staffers, a Mr. Ogden called him back this afternoon and said he would make sure that Berger was aware of the issue. 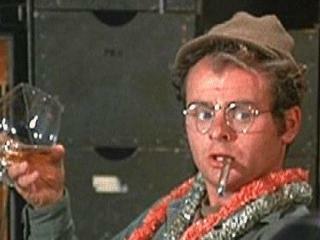 Ogden also stated that he liked RADAR’s SOLUTION to the DACA SNAFU. 2) The County BoE’s will supply this DACA list to every polling location for early voting that begins on Thursday the 23rd. As individuals come into vote, the registrar will look-up the voters name on the normal list, verify Address as normal operations cite, but then also check the DACA list to see if they are on that one too. Should only take an additional 30-45 seconds per voter to do this. 4) If the Individual is on the VOTER Rolls AND also on the DACA list, Flag THAT VOTER and report them to the Election Judge or Judges that are on site at the polling location. a) If the Individual starts a commotion, or if there are any hesitant / uneasy feelings whatsoever, on anyone’s part, Issue that person a Provisional Ballot and allow them to continue w/ the process. b) This should be NO ISSUE for the Legal Advisers because according to NCGS § 163-82.4 — It IS the responsibility of the County BoE’s to correct any Incorrect Information on a Voter Registration Form. 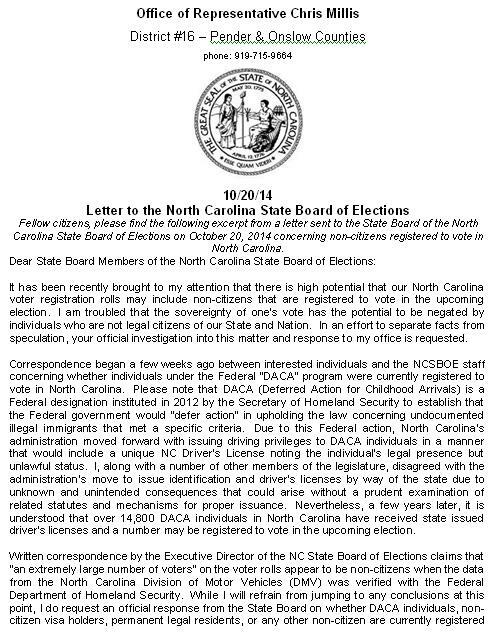 Fellow citizens, please find the following excerpt from a letter sent to the State Board of the North Carolina State Board of Elections on October 20, 2014 concerning non-citizens registered to vote in North Carolina. It has been recently brought to my attention that there is high potential that our North Carolina voter registration rolls may include non-citizens that are registered to vote in the upcoming election. I am troubled that the sovereignty of one’s vote has the potential to be negated by individuals who are not legal citizens of our State and Nation. In an effort to separate facts from speculation, your official investigation into this matter and response to my office is requested. Correspondence began a few weeks ago between interested individuals and the NCSBOE staff concerning whether individuals under the Federal “DACA” program were currently registered to vote in North Carolina. Please note that DACA (Deferred Action for Childhood Arrivals) is a Federal designation instituted in 2012 by the Secretary of Homeland Security to establish that the Federal government would “defer action” in upholding the law concerning undocumented illegal immigrants that met a specific criteria. Due to this Federal action, North Carolina’s administration moved forward with issuing driving privileges to DACA individuals in a manner that would include a unique NC Driver’s License noting the individual’s legal presence but unlawful status. I, along with a number of other members of the legislature, disagreed with the administration’s move to issue identification and driver’s licenses by way of the state due to unknown and unintended consequences that could arise without a prudent examination of related statutes and mechanisms for proper issuance. Nevertheless, a few years later, it is understood that over 14,800 DACA individuals in North Carolina have received state issued driver’s licenses and a number may be registered to vote in the upcoming election. Written correspondence by the Executive Director of the NC State Board of Elections claims that “an extremely large number of voters” on the voter rolls appear to be non-citizens when the data from the North Carolina Division of Motor Vehicles (DMV) was verified with the Federal Department of Homeland Security. While I will refrain from jumping to any conclusions at this point, I do request an official response from the State Board on whether DACA individuals, non-citizen visa holders, permanent legal residents, or any other non-citizen are currently registered to vote in North Carolina. Also, if non-citizens are found on the voter rolls, please officially respond to the likely procedure in which these non-citizens were allowed to register to vote (since the very first requirement is to be a United States citizen) and the Board’s actions for immediate removal. Thank you for your attention to this important matter and for your service on the State Board. I look forward to your response concerning the facts surrounding non-citizens on North Carolina’s voter rolls, their pathway to becoming registered to vote, and future action to be taken by the Board. Based upon this information it is my desire that the people of North Carolina, and their state elected officials, would be properly informed and would take the necessary action to protect the sovereignty of the vote of each and every citizen of our great State. Respectfully submitted by SilenceDogood2010 this Twentieth Day of October in the Year of our Lord, Two Thousand and Fourteen. UPDATE: Thursday October 23, 2014 at 12 noon – “Thank You” to The Daily Haymaker for picking up this story. UPDATE: Sunday October 19, 2014 at 8am – “Thank You” to the Carolina Plott Hound for picking up this story. On Thursday, October 16, 2014, I was contacted concerning the fact that 10,000 +/- DACA individuals (Deferred Action for Childhood Arrivals) were found on our North Carolina Voting rolls. They are registered to Vote! These individuals are NOT Citizens of our country. Here’s how it works; The DACA people are allowed to be issued Drivers Licenses. They go thru the NC DMV process and are issued a Drivers License that states NO LAWFUL STATUS. 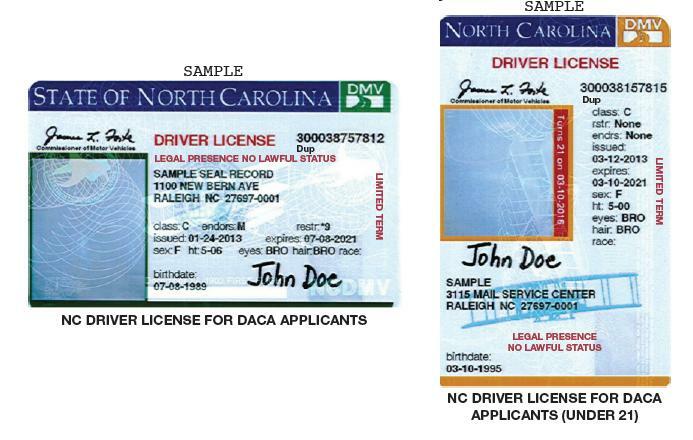 Sample of NC DACA Drivers License. Note the RED ‘NO LAWFUL STATUS’ displayed on the front of these. 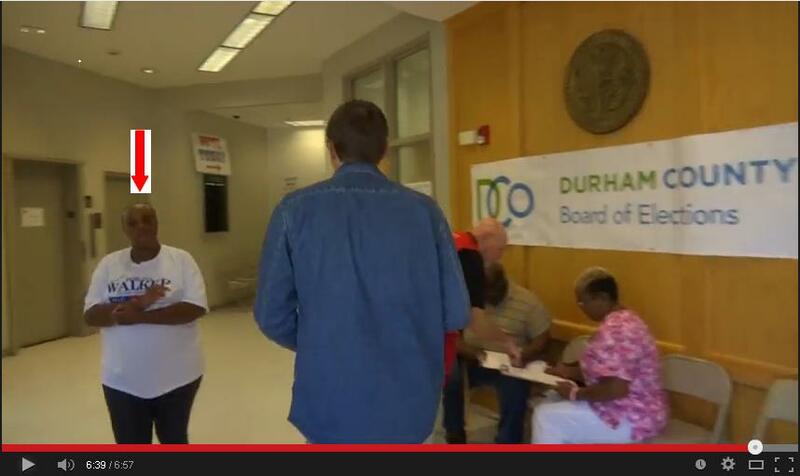 Now, every week or so, the NC DMV submits a list to the North Carolina State Board of Elections in Raleigh. The people on these lists have been issued a NCDL, but they are NOT Eligible to Vote. Well, according to the NC State BoE, they have to double check with our Federal Department of Homeland Security via the U.S. 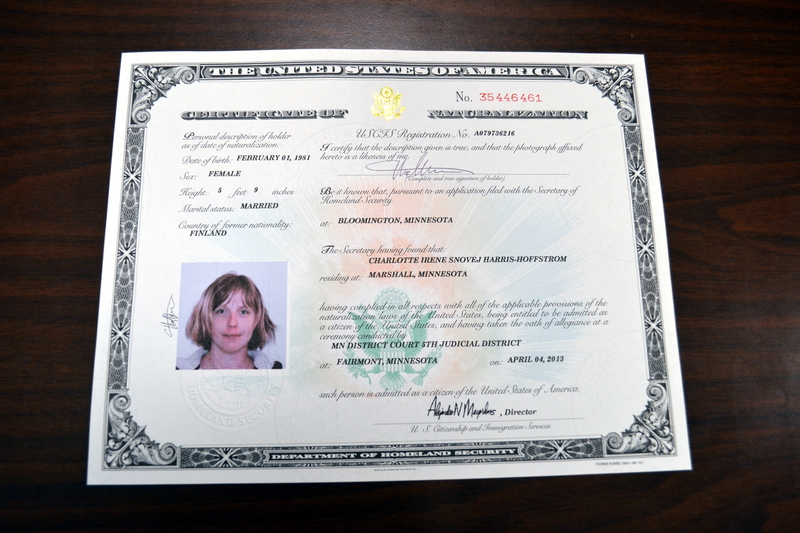 Citizenship and Immigration Service (USCIS). Here is where things get ‘SCREWY’ — According to Kim Strach, The Executive Director of the NC State BoE, there are “an extremely large number” of people that the Feds say are Legal, yet they were not legal when they were issued DACA Drivers Licenses. One can NOT go from DACA Status this month, to Citizen Status next month. Or even in 4 or 5 months. NC FIRE, North Carolinians For Immigration Reform and Enforcement, has been on top of this issue for a while now. I want to make something perfectly clear about the 10,000+ illegal alien voters on NC voter rolls. I am being questioned from all sides about the numbers I quoted. While there may not be exactly 10,000+ of the 14,836 illegals who have received a NC drivers license, I will stand by the fact that “an extremely large number of them are showing up on the NC voter rolls” because that is a direct quote from Kim Strach who is the Executive Director of the NC State Board of Elections. I obtained the DACA license issue list (14,836 DACA licenses issued as of 9/20/14) from Sophia Spencer who is the Records Manager at the NC Department of Transportation. Now, the person who is tasked with checking and removing the names from the NC voter rolls is Brian LiVecchi- special counsel to the NCSBOE. During our initial conversation on Wed Oct 15th, we were discussing the DACA license issue list which is forwarded to his office every week by the NCDOT. I asked specifically about the 14,836 and how many were showing up on the voter rolls. He explained that the number was around 10,000+/-. On Fri. Oct 17th, he called me back saying he has been inundated with calls and wanted to “set the record straight” as to the 10,000 number he was referring to. That the numbers were nowhere near the 10,000 we were quoting. This was after the email we sent out statewide. His response was two-fold. Well that makes no sense. Illegal aliens have to be “declared” DACA eligible by the Federal Gov’t if they want to obtain a NC drivers license. They complete the forms from the gov’t and take them to the NCDMV to obtain their license. There is NO question that they are illegal when they present the forms to the NCDMV and they are marked as such and issued a license that basically says so on it. They don’t have green cards, or haven’t been granted permanent resident status or any other classification other than illegal with deferred deportation status. If that’s the case, they would have weeded those out on a weekly basis so the list he is working on currently, wouldn’t be 10,000+/-. You don’t qualify as DACA one week and be granted a green card or permanent resident status the next. It simply doesn’t happen that way or that fast. Second, he explained that he was having to go through every one of the registrations, one-at-a-time, that it takes several minutes to check each one and that there was no way to “batch check” them with the Federal Gov’t. He continued, having only one staff member, that we are having to pay an enormous amount of overtime to, he didn’t have enough staff to complete the job before the election much less before early voting begins on Oct 23rd. Well, that was the intent of the email we sent out. It was to get him the help he needed to complete the checking process before the election in Nov.
And here is the second problem that we have with all of the explanations. If the numbers were no where near the figures we quoted, then why did Kim Strach, who is the Executive Director of the NCSBOE, say this in her response to Rep George Cleveland’s inquiry as to whether there was a problem with the DACA names on the voter rolls and why did Rep George Cleveland direct his assistant, Pamela Ahlin, to email it to every NC House member? From here on down is the text of emails sent between NC Representative George Cleveland, Kim Strach of the NC SBoE, and James Johnson President of NCFIRE. Rep. Cleveland asked me to send this information to you since you were copied on the request for information on the Oct. 12 email from NCFIRE. I have been addressing this issue since last year. We do conduct audits that look at DMV data to identify non-citizens. 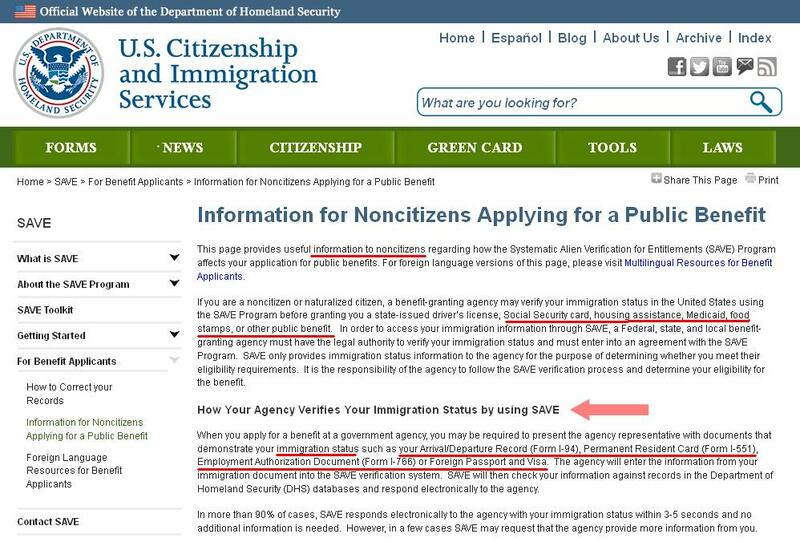 We then have to verify info through Homeland Security and the results we have been receiving show there is an extremely large number of voters that appear not to be citizens in the data we get from DMV but are citizens we when verify with Homeland Security. We’re working with DMV to identify the issues. Let me know if you have questions or want to talk. Kim – is there a problem here? #2- Do you plan to check the voter rolls for names and addresses of DACA license recipients before early voting begins on Oct 23rd? Currently 45 states participate in the DACA Program. Respectfully submitted by SilenceDogood2010 this Eighteenth Day of October in the Year of our Lord, Two Thousand and Fourteen. Get on the phones this morning and make calls to the Buncombe County Sheriff’s Office. I am calling today to DEMAND that Sheriff Duncan Charge & Arrest Federal Court Judge Max O. Cogburn Jr. for the crime of Perjury. Judge Max O. Cogburn Jr. did Willfully, and with Malice, violate his Oath of Office in open Court on Friday October 10, 2014. The legal definition of Perjury is — “the violation of an oath” — AND, since you yourself sir have taken an Oath to uphold the Laws of the State of NC, I’ll point you to NCGS 14-209. ” § 14-209. Punishment for perjury. The crime of perjury was committed when Judge Max O. Cogburn Jr. ruled on the issue of NC’s Marriage Amendment. No where in the US Constitution does it state that the Federal Judiciary has any enumerated powers to regulate, or oversee, marriage. However, the 10th Amendment to our US Constitution CLEARLY states that all powers NOT DELEGATED to the Federal Government by the constitution shall be left up to ‘We the People’. We the People of NC decided on May 12, 2012 that marriage is between ‘ONE MAN & ONE WOMAN ONLY’! Then ask them —- What do you hear at VERY END of every Wedding over the last 150 years or so? Please tell me? Also contact Attorney General Roy Cooper’s office with the same message. Respectfully submitted by SilenceDogood2010 this Thirteenth Day of October in the Year of our Lord, Two Thousand and Fourteen.